Hundreds of thousands of people filled the streets of Downtown Los Angeles on Saturday morning for the Women’s March, held in response to the inauguration of Donald Trump as president the previous day. 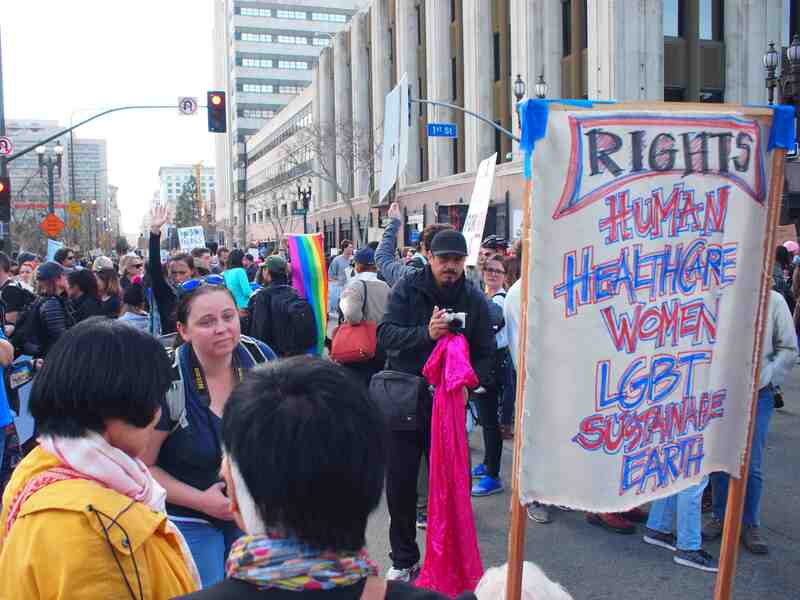 The march, held in conjunction with marches in Washington, D.C. and other cities across the country and around the world, included advocates for a variety of causes, including women’s rights, LGBT rights, the environment, affordable health care, and immigrant rights. On the latter issue, specifically fears that Muslim Americans will be targeted by the new administration, one participant drew attention by riding in a wheelchair with a sign reading, “Locked up by U.S. prez 1942-1946. Never again!” Her photo has been widely seen via print and online media. Kiyoko Shima (aka Shimabukuro), 98, lived in the Sawtelle area was sent to Rohwer in Arkansas during World War II, one of the camps where actor/activist George Takei and his family were held. She was accompanied during the march by her daughters, Sallie Masako Smith and Linda Chiyo Shima-Tsuno, and son-in-law, Randall Tsuno. She was incarcerated with her husband, Matsusho, and her first-born, Nancy Hatsumi Usui. Two of her children, Fred Tadashi Shima and Iris Mieko Osumi, were born in camp. Shima, who has lived at the same house in South Los Angeles since 1950, had a second son, Thomas Kiyoshi Shima, after camp. He participated in the march with his partner, Barbara Kallir. Shima has six grandchildren and four great-grandchildren. 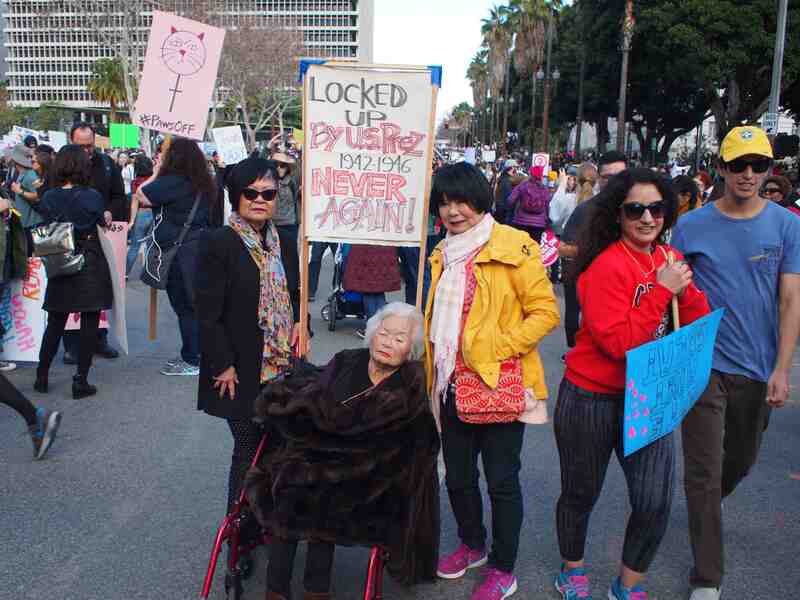 Participating in the march were granddaughter Jill (Usui) Datwyler, her husband John Datwyler and their daughter Maya Datwyler, 14; granddaughter Carrie Usui Johnson; grandson Devon Tsuno, his wife Rieko Takamatsu and their son Rui Tsuno, 5. There was an API contingent at the march, including such organizations as Nikkei for Civil Rights & Redress, Center for the Pacific Asian Family, API Equality-LA, and Asian Pacific American Women Lawyers Alliance. The march was peaceful and police said no arrests were made. The back of Kiyoko Shima’s sign listed the rights that marchers were fighting for.